DOCK 6.9 has been released. This is a release of the new ligand searching method DOCKDN: De Novo design using fragment-based assembly. De novo design can be used to explore vast areas of chemical space in computational lead discovery. DOCKDN is an iterative fragment growth method, in which new molecules are built using rules for allowable connections based on known molecules. I've written a couple of tutorials on docking here and here that have been popular pages. 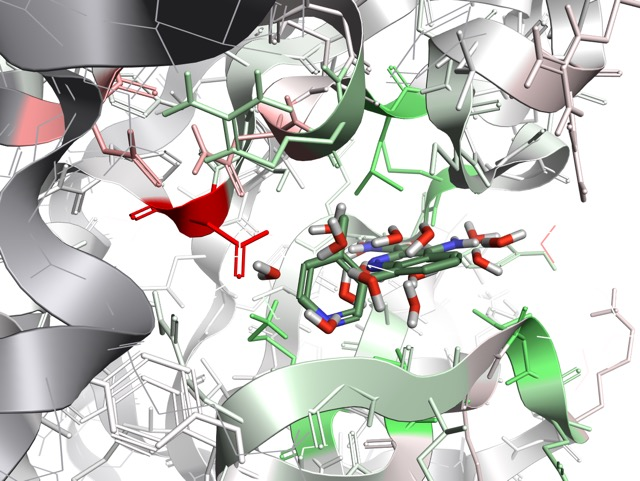 The tools used for docking are being regularly updated and so the D3R Grand Challenge 4, a new blinded prediction challenge for protein-ligand poses and affinities is an invaluable data point for comparison of the current state of play. Full details will be published on the Drug Design Data Resource site. A new version of SeeSAR is available (7.3), this update includes. 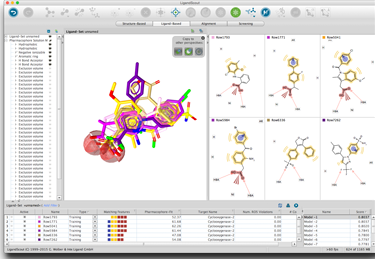 The LigandScout software suite comprises the most user friendly molecular design tools available to chemists and modelers worldwide. 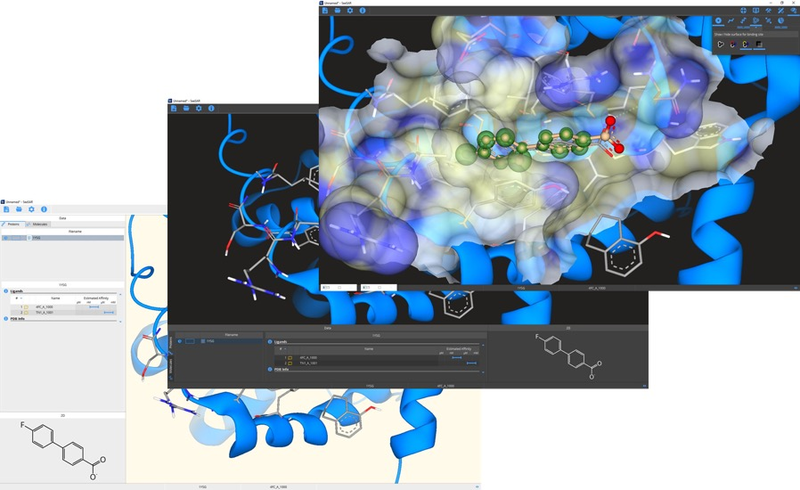 The platform seamlessly integrates computational technology for designing, filtering, searching and prioritizing molecules for synthesis and biological assessment. StarDrop 6.4 now links prepared 3D docking and alignment models with data visualisation, 2D SAR analyses and predictive models in a single interface. …extendable to other third party applications. The Pose Generation Interface communicates with a Pose Generation Server, on which computational chemists can easily publish their validated docking or 3D alignment models. 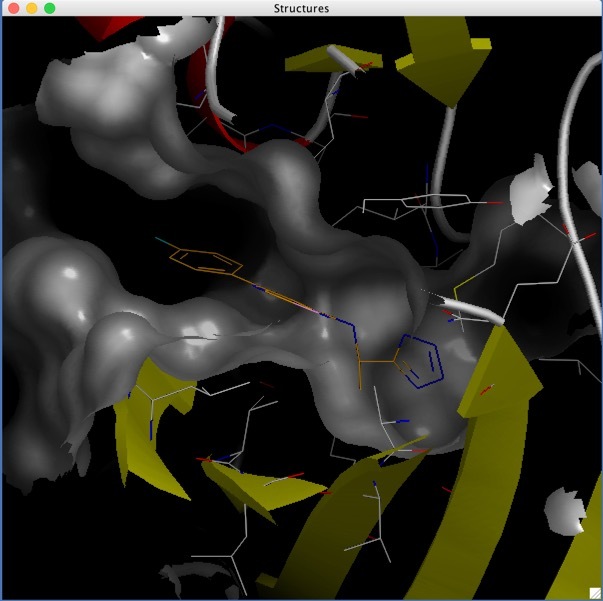 These are made instantly available for StarDrop users to submit their compounds and the resulting poses, protein structures and scores are returned directly to StarDrop for visualisation and analysis. There are more details in the poster presented at the Spring ACS 2017. New Scoring Functions Two new scoring functions were added: pharmacophore score , and descriptor score [see the manual]. Pharmacophore: Calculates the pharmacophore overlap between a candidate and a reference molecule. 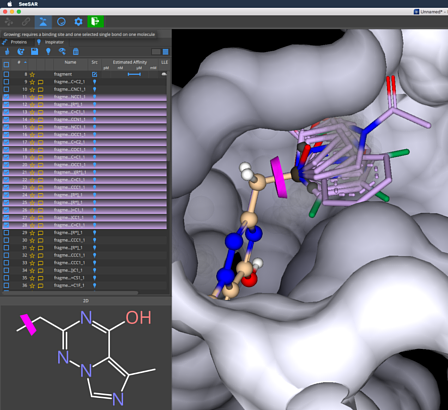 In addition, the python wrapper, mol2bild.py, can be employed to visualize the pharmacophores. Descriptor Score: Descriptor Score was completely overhauled. Presently, descriptor score is now a wrapper that allows multiple scoring functions to be employed simultaneously. Please refer to the manual for the complete list of scoring functions supported by descriptor score. Four similarity-based scoring functions were added as part of descriptor score: pharmacophore score, Tanimoto score, Hungarian matching similarity score, and volume overlap score. Hungarian matching similarity score, Tanimoto score and volume overlap score, new to DOCK, can only be called using descriptor score. a) The code has been optimized for calculating the repulsive VDW term. "internalenergyrep_exp", when set to its default value of 12, results in a significant speedup in certain cases. Values other than 12 are computed as in previous versions of DOCK. b) The term "internalenergycutoff" has been added such that all conformers with an internal energy greater than the cutoff are pruned. c) The addition of the term "pruningconformerscorescalingfactor", a divisor of the pruningconformerscore_cutoff, ensures that pruning becomes more stringent as flexibly-grown molecules proceed layer-by-layer. Miscellaneous DOCK now supports builds using Intel compilers with either MPICH2 or Intel MPI parallelism. A new version of SeeSAR is now available for download. Version 5.5 includes several new features and has undergone some tweaks under the hood to improve speed. OpenEye have announced the release of OEDocking v3.2. This is an upgrade that adds new features and fixes several bugs. POSIT is now integrated with the OEDocking suite. A POSIT license is still required to run POSIT. POSIT‘s clash detection algorithm has been enhanced. It now ignores clashes with the protein on a per atom basis if the crystallographic ligand makes these same clashes. OpenMPI version 1.6 is now supported on all platforms. The -mpinp and -mpihostfile flags are now used to run FRED, HYBRID and POSIT in MPI mode. These new flags replace the oempirun script. PDB2RECEPTOR now incorporates all of MAKEPOSERECEPTOR functionality. MAKEPOSERECEPTOR is no longer supported. PDB2RECEPTOR now supports the identification and selection of a desired ligand in a protein-ligand complex. MAKERECEPTOR, PDB2RECEPTOR, APOPDB2RECEPTOR, DOCKINGREPORT, RECEPTORSETUP and RECEPTORTOOLBOX now all accept either a POSIT or FRED2 license. Support for Mac OS X 10.9 and 10.10 was added. Mac OS X 10.6 and 10.7 are no longer supported. SAMPL5: Prediction of aqueous host-guest binding free energies and, optionally, enthalpies for three host-guest series. A series of aqueous-organic partition coefficients may also be added in the next several weeks. Predictions are due February 1, 2016. For details, and to participate, please see https://drugdesigndata.org/about/sampl5. BioSolveIT has just announced the release of SeeSAR 3.0. Project files Starting with Version 3.0, SeeSAR allows you to store all session data in a project file. 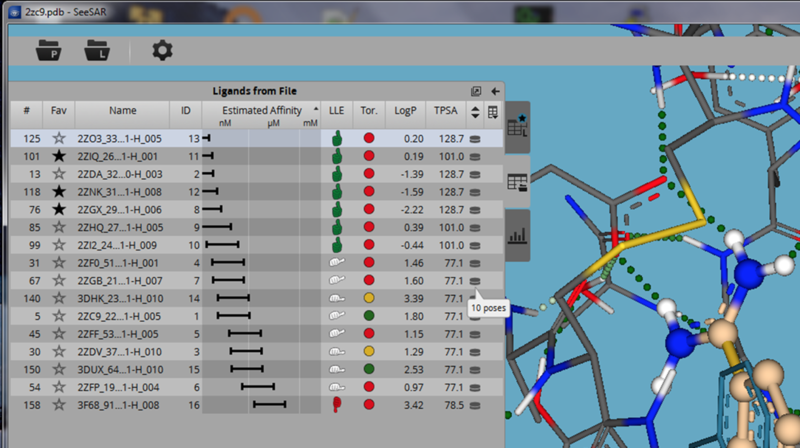 This includes the protein, ligands loaded from file and new (edited) ligands. Resuming your work on a project is now as easy as double-clicking on the project-file. As a result, everything just got a hell of a lot faster! Whilst calculating Hyde-scores for say 1000 compounds took around half an hour (depending on your hardware), loading the same information from a project file now takes only a few seconds. Note that you can also generate a project file on the command line, allowing you to outsource the calculation of Hyde-scores to a different machine. This enhancement is also a great way to exchange data and ideas with a colleague! Simply store your SeeSAR session as a project file in a commonly accessible location (e.g. a network drive). Your colleague can take a look with just a double-click. Hyde update Hyde is quite sensitive with regards to the precise geometry of a binding pose. Even the tiniest difference in a pose can distort an anyway stretched hydrogen bond just so much that it is not recognized anymore - thereby leaving you with a huge desolvation penalty for such atoms, without the gain from the h-bond. This "sharpness" of Hyde is its greatest strength (for example by highlighting real activity cliffs), but also its greatest weakness (especially if the structure has flaws or is of low resolution). In order to minimize such troubles, we optimize each pose before the Hyde affinity assessment. We improved this optimization significantly. It is now fully flexible and with sharper clash criteria, making it suitable for docked poses as well as edited compounds. All of this as efficient as before, just perfect for interactive use. 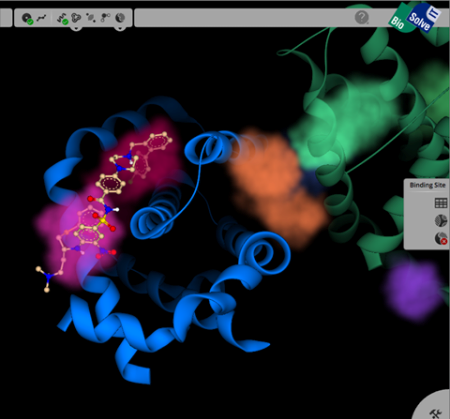 SeeSAR it is an interactive tool for designing/improving ligands for drug discovery from BioSolve-it, that has been recently updated. Looking through the updates it is clear they have been very receptive to user feedback. Solution filter, Finding interesting solutions in larger sets of compounds has become much easier in SeeSAR. Compounds can now be filtered based on any available property – allowing you to easily trim down the compound set to the most interesting subset. As before, you can browse through and sort the remaining table entries to further refine your selection. Properties can be those generated by SeeSAR (such as the Hyde affinity assessment, the torsional strain, TPSA, logP, ...) or alternatively properties loaded from an SD file. Joined poses, You can now join the ligands found in the protein structure, compounds loaded from file and compounds newly generated within the SeeSAR editor into one “super” table and now provide quick-links to the previous view of only those from a certain origin. This allows you to see in one table the bound ligand as a reference, the project compounds and your last round of designs. You can then select your favorites from the entire table and export these (for example for an upcoming team meeting). Defining the protein, SeeSAR decomposes the contents of a PDB file into chains, small molecules, waters and ions. Until now, users had to accept SeeSAR's default assignments, which is fine in the majority of cases. However, there is no rule without exception, e.g., the peptide inhibitor which is mistaken as a short chain, the small molecule which is actually a co-factor, or the solvent molecule that should be ignored. With this update, SeeSAR allows you to change these default assignments to better handle these exceptional cases, allowing you to categorize a short chain as a bound ligand, or re-assign a co-factor as a permanent part of the protein. You can also eliminate protein elements altogether. SMILES, PDB and MOL file support, SeeSAR now comes with with additional molecule readers that broaden the scope of the application. Aside from standard 3D molecule file formats (SDF and mol2), SeeSAR now supports 1D and 2D file formats as well as reading small molecules from PDB format. 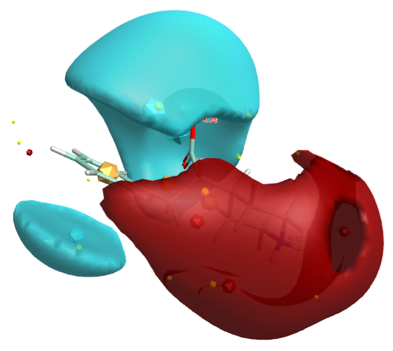 If no 3D coordinates are given, SeeSAR will calculate a clash-free, low energy conformation on the fly: with the SeeSAR positioning function you can then place such input molecules in the active site of interest. 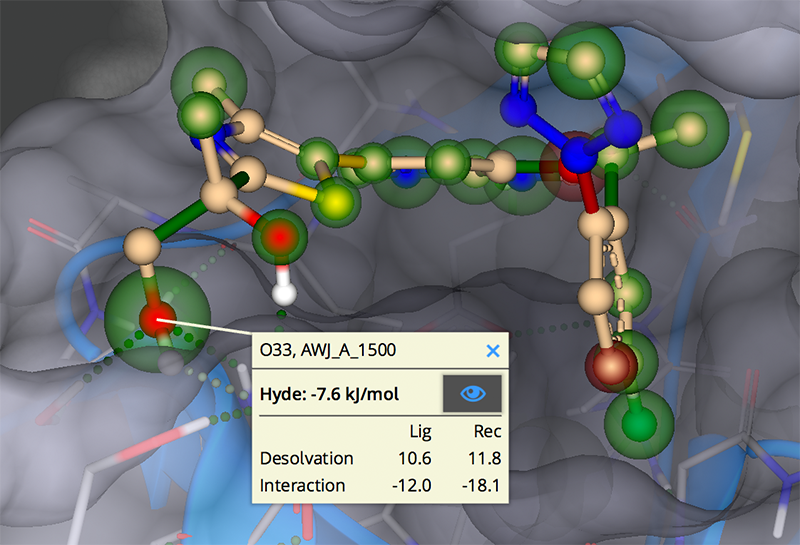 Amongst other things, this feature facilitates the importing of molecules straight from your favourite chemical drawing program and assessing such structures in in the context of your protein of interest. There is a review of an earlier version of SeeSAR here, and a tutorial showing how to incorporate SeeSAR into a KNIME workflow. DOCK 6 is written in C++ and is functionally separated into independent components, allowing a high degree of program flexibility. Accessory programs are written in C and Fortran 77. Source code for all programs is provided. Read the FAQ for details of installation under MacOSX. Allen, W. J.; Balius, T. E.; Mukherjee, S.; Brozell, S. R.; Moustakas, D. T.; Lang, P. T.; Case, D. A.; Kuntz, I. D.; Rizzo, R. C. DOCK 6: Impact of New Features and Current Docking Performance. J. Comput. Chem. Submitted. I was at the Cresset UGM last week and had a chance to hear more about BlazeGPU. The original CPU application Blaze uses the shape and electrostatic character of known ligands to rapidly search large chemical collections for molecules with similar properties. The latest version BlazeGPU runs at 40 times the speed of the CPU version of Blaze but loses nothing in accuracy. At a fraction of the hardware cost, BlazeGPU delivers the same effective, ligand based virtual screening as Blaze, based on the shape and electrostatic nature of molecules. BlazeGPU is written in OpenCL and OpenCL libraries are available from NVidia and AMD for their graphics cards, but also from Intel for the CPU and for their new Xeon Phi coprocessor cards. BlazeGPU is currently designed only to run on the GPU - for CPU-only clusters the original code is just as fast, and on a machine with a reasonably fast GPU or two the CPU tends to run flat out just feeding data to the graphics card, so there's not that much gain running on the CPU as well as the GPU. Currently the conformer generation still runs on the CPU, but they are looking at the possibility of porting that to OpenCL as well in the future. 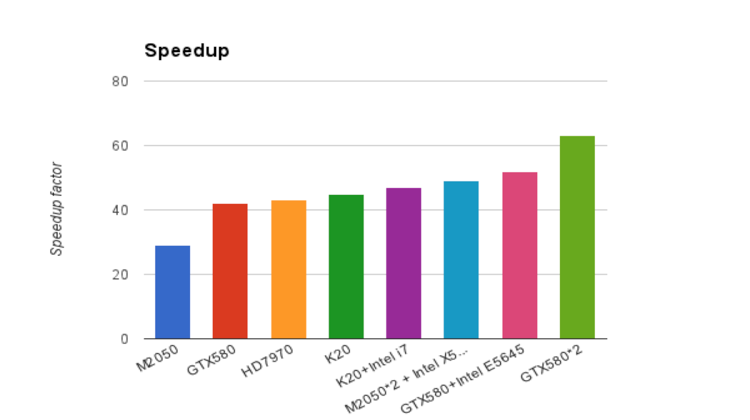 The relative performance is shown in the plot below, it is worth noting that these are relatively inexpensive graphics cards that you can pick up on Amazon or ebay for a few hundred pounds. Also note for a $2.10/hour GPU instance on AmazonEC2 you can process 2m conformations. There are more examples of GPU science here.